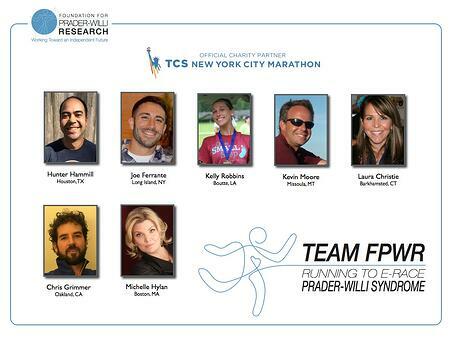 For the first time ever, the Foundation for Prader-Willi Research will be represented November 6th on the streets of New York at the largest marathon in the world – The TCS New York City Marathon! “We are excited to partner with the TCS New York City Marathon,” said FPWR Executive Director Susan Hedstrom. "Our marathon team is a group of passionate runners dedicated to eliminating the challenges of Prader-Willi syndrome and we greatly appreciate their tremendous effort in support of our mission." Each team member has committed to raising a minimum of $5,000 each, making this opportunity a great one for not only raising awareness, but fundraising too! Team members have already raised over $36,000 with the race still being months away! Had you asked Michelle Hylan two years ago if she’d be running her reply would have been: “through a shoe store for a sale, yes, but 26.2 miles – no way!” As luck would have it, however, it was two years ago that she began working for Rhythm Pharmaceuticals, overseeing a Phase 2 clinical trial for patients with PWS. Since beginning her work for Rhythm, Michelle has become invested in PWS and is deeply committed to working with the PWS community to find a solution. Our team members, all like Michelle, are thrilled to have the opportunity to raise awareness and critical funds for our loved ones with PWS. We hope you’ll help us cheer them on as they train this summer for the race of a lifetime on November 6th! If you’d like to help support the team, click here to make a donation! Feeling inspired by our runner? You can support PWS research at a race of your own! Register as a Virtual Walk participant on our OSS website and turn any race into a fundraiser! The TCS New York City Marathon is the premier event of New York Road Runners (NYRR) and the largest marathon in the world. Over 1,000,000 people have finished the race since its first running in 1970 with just 127 entrants and 55 finishers running four laps around Central Park. The race expanded to all five boroughs in 1976 and is now in its 40th year as a five-borough affair. Held annually on the first Sunday of November, the race features 50,000 runners including the world’s top professional athletes and a vast range of competitive, recreational, and charity runners. Participants from over 125 countries tour the city, starting on Staten Island at the foot of the Verrazano-Narrows Bridge and running through the neighborhoods of Brooklyn, Queens, and the Bronx before ending in Manhattan. More than one million spectators and thousands of volunteers line the city streets in support of the runners, while millions more watch the live television broadcast in the New York area on WABC-TV, Channel 7, nationally on ESPN2, and via various international broadcast partners around the world. The race is part of the Abbott World Marathon Majors, which features the world’s top marathons—Tokyo, Boston, London, Berlin, Chicago, and New York—and crowns the top professional male and female marathoners each year. Tata Consultancy Services (TCS), a leading global IT services, consulting, and business solutions organization, is the premier partner of NYRR and the title sponsor of the TCS New York City Marathon. The 46th running of the TCS New York City Marathon is set for November 6, 2016. To learn more, visit www.tcsnycmarathon.org. Dana, mom to Ella, has been involved with FPWR since 2012. In addition to hosting a multitude of small fundraisers, she hosted the largest One SMALL Step event of 2013 raising over $100,000 for Prader-Willi research! Dana is a seasoned fundraiser and walk host and provides our One SMALL Step hosts with guidance, tips and support throughout the walk planning process.